It has been several months in the making, but we now present to you the brand-new FatherWathen.com, which has a nice fresh look, along with a few more features that will make the website go farther in helping us reach our apostolate. The most significant change is that we now offer access to many of Father’s recordings. Thanks to the generosity of some of Father’s followers, we have sourced many of his Sunday sermons going back all the way to 1973, and have begun the slow process of having them professionally restored so that they will be more presentable than the ones we had on this site previously. They will not be perfect–as most were recorded in an open-air setting onto cassette tapes which are showing deterioration from time–but we hope that there is enough of Father in there for you to enrich yourself as he enriched many others. 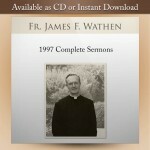 We have also found some of the original recordings of Father’s radio essays, which were broadcast in the early 1990’s. These thankfully were recorded with professional equipment and most of them come to us in impeccable quality, as you may see for yourself. You may listen to the entirety of any of Father’s weekly sermons in our store by visiting the product page. The first lecture in Father’s Radio Essays are also available for preview. 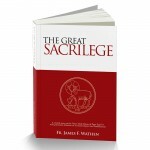 We also have options to purchase a download or CD of each of these sermons. All purchases go towards the continual operation of the Foundation. We hope you will enjoy Father’s voice as much as we have!